Brand loyalty is a common theme among yacht builders. It’s definitely a theme at Nordhavn, where hull number one of the Nordhavn 96 series is in the hands of a previous client. She’s christened MacGuffin. The yacht arrived from Pacific Asian Enterprises’ shipyard in China in early February. Final fit-out took place stateside, a customary situation. The owner, an American, had recently enjoyed cruising aboard a Nordhavn 86. The new 96 is based on that hull platform. LOA is 96’7” (about 29.5 meters). The extra LOA comes mostly aft. This benefits guests as much as crew, should buyers have them along. (Some Nordhavn owners like solo operations, or cruising with minimal crew on occasion. In the case of MacGuffin, there are four full-time crewmembers.) The additional length also applies through the lazarette, the cockpit, the saloon, and the upper deck. The beam is the same as that of the 86. But, it’s more than healthy, at 24 feet (7.3 meters). Since Nordhavn lets owners personalize their yachts, MacGuffin shows off some nice touches. Stainless steel trim is one. Another, sure to be used on chilly days and nights, is a fireplace (above). It’s in the skylounge—which, in an interesting option, can be a master stateroom instead. 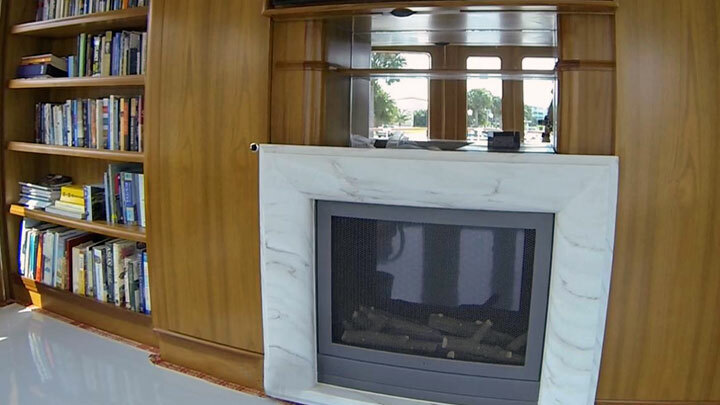 In combination with the warm teak wood, the fireplace should make the yacht feel cozy, even if the owner and guests are enjoying snow-capped views out the full-height glass wrapping around the room. A total of eight passengers can enjoy cruising aboard MacGuffin. There are plenty of locations awaiting them. Nordhavn says the 96 has a 4,000-nautical-mile range at 9 knots. Even at 10 knots, the yacht should still be able to cross the Atlantic on her own. Mindful of these voyages, the Nordhavn 96’s standard machinery includes 50-hp bow and stern thrusters and 2,000-gallon-per-day watermakers. Oh, and don’t forget the hot tub. MacGuffin, being a proper yacht, has one on her flying bridge. What better way to watch the horizon come into view? 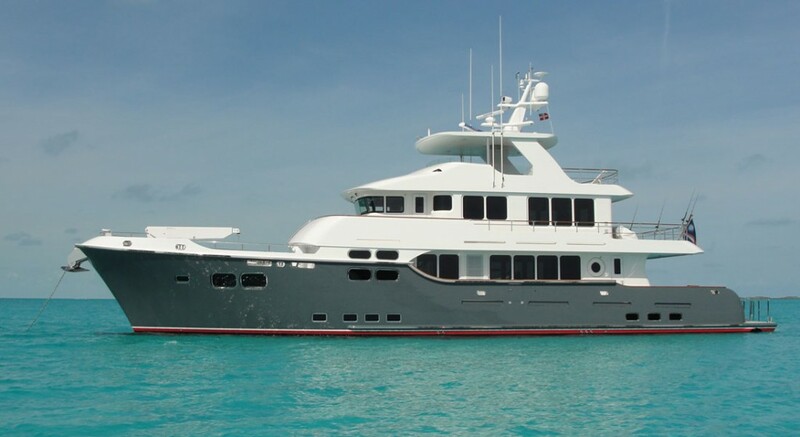 Nordhavn sells new yachts directly to buyers, plus has brokerage listings. Check http://www.nordhavn.com/brokerage/index.php for brokerage details.